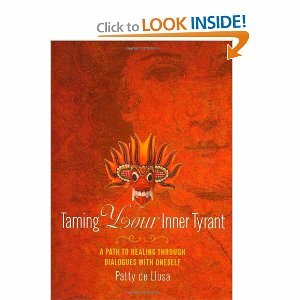 Taming Your Inner Tyrant: A Path To Healing Through Dialogues with Oneself (A Spiritual Evolution Press, 2011) is a combination of memoirs and self-help book, as the author, Patty de Llosa walks us through her journey of self-preservation and healing and teaches us how to accomplish similar understanding and success along the way. Taming Your Inner Tyrant describes my experiences with psychiatrist C. G. Jung's "active imagination" exercise, in which I dialogued with my intrusive inner critics over many years and gradually found relief from both physical and psychic pain. Now that Jung’s Red Book has been published, hailed by the New York Times as “the Holy Grail of the Unconscious,” there’s increasing excitement about this mysterious process. Yet a book about it written by a non-psychotherapist is very rare, if not unique. That’s why I offer my imaginal adventure, with an eye to helping others undertake a similar journey. Each chapter ends with experiments the reader can make, to learn more about his or her personal inner tyrants. I have to admit, I was a little afraid of this book, I was thinking "Oh great another boring just do this and you,re cured book." However, I am quite aware of my own inner "tyrant", as she calls it, so I just went for it. The book surprised me, it was really nothing like I thought it would be. It was actually an enjoyable read. It was well written and kept you interested and reading. She told you pieces of her life and the "battles" with her inner tyrant that she endured and then after each section she walks you through various exercises and questions to help the reader begin to deal with their own inner tyrant. I found the book refreshingly honest and easy to relate to. I admit, I am far from "cured" from my inner tyrant but at least I feel I have made a step in the right direction and have some tools to really get me started. Taming Your Inner Tyrant is available from Amazon, Barnes & Noble and from the author, Patty de Llosa herself. Thank you to Media Muscle for my sample used in this review, opinions are honest, review by Michelle.